For Syrup – In a pan add water, sugar. Bring it to boil, stir until the sugar has dissolved. Turn off the heat. Set aside. In a bowl, mix milk powder, maida, baking soda, and elaichi. Add cream and mix it well. This will be consistency of soft dough, if it is too dry add 1 to 2 spoons of milk as needed not the cream. Dough should be very soft and sticking to fingers, as dough sits milk powder will absorb the extra cream. Cover and set aside for about 10 minutes. Knead the dough; grease your palm before working the dough. Divide the dough into 18 equal parts and roll them into round balls. Heat the oil in a frying pan on medium heat. The frying pan should have at least 1 inch of oil. Note: To test if the oil is the right temperature, place a small piece of dough into the oil; it should sizzle but the dough should take 30 seconds to rise. If the dough rises faster, oil is too hot; if it just sits without rising, oil is not hot enough. Place the gulab jamuns in the frying pan. Note: Remember gulab jamuns will expand to double the size, so give them enough space. Do not over crowd. It should take about 7 minutes to fry the gulab jamuns. While frying keep rolling the gulab jamuns so they are evenly browned. 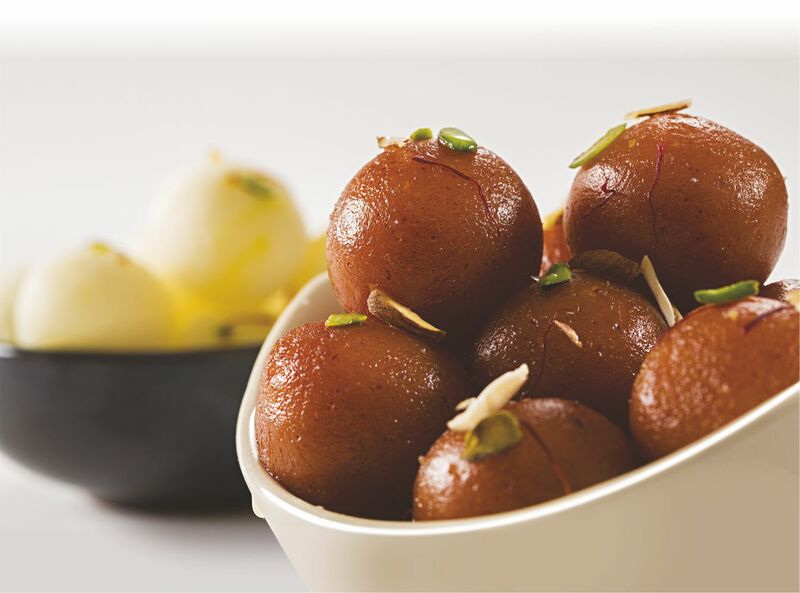 You can make gulabjamuns in different size and shape. Fry until the gulab jamuns become brown. The gulab jamuns should sit in the syrup for at least 20 minutes prior to serving. Serve hot or chilled with sprinkled chopped dry fruits.